Two years into his presidency Gambian President Adama Barrow has claimed that he has more power than former Gambian dictator Yahya Jammeh because he has not only the police, the SIS (formerly NIA), the Army and West African troops (ECOMIC) working for him. The new president who was elected to oversee a transition government after twenty-years of dictatorship to restore democracy, rule of law and democracy in the small West African country appears to be comfortable in power and now making serious dictatorial statements. The president made the threatening statement at the State House Sunday during a visit with West Coast Region elders and supporters. He said “The Gambian people were scared of Yahya Jammeh’s power because he had the police, the NIA, the Army, but I am more powerful because I have the Police, the NIA, the Army and ECOMIG forces” . The president made this reference to show Gambians that he too has control of state security apparatus and therefore could impose the same fear and terror on Gambians if anybody wants to cross his line or challenge his authority. The President’s comments sent shock waves across the globe and got Gambians talking and left many in shock. For a president who was elected to restore rule of law, democracy and Human Rights to make such statements referencing over two decades of abuse of power in the Gambia is very terrifying and unfortunate. It is not clear why the president made such statements or what he was thinking, but it appears to be an emerging pattern of behavior and consolidation of power by the new Gambian President. Few weeks ago President Barrow made similar statements at the State house insinuating that anybody who contest the leadership of his former party UDP from which he resigned to be elected a coalition candidate would be plotting a coup d’tat against him. The president was making reference to an ongoing leadership struggle within the largest political party UDP which recently won elections across the country. 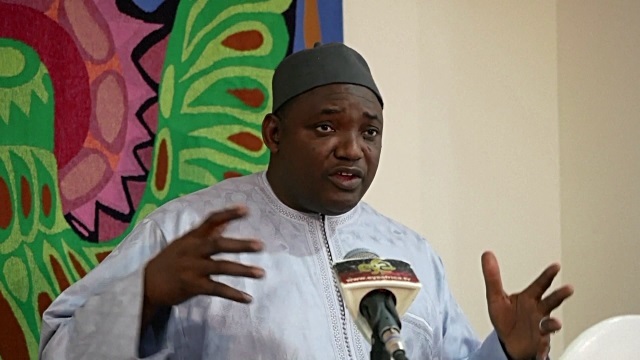 Many Gambians are baffled by these statements coming from President Barrow especially at a time when victims of tyranny and dictatorship are still suffering and waiting for justice two years after he took over office. Such statements regardless of their motives are severely insensitive and disrespectful to victims of human rights abuse. It is also a direct threat to a fragile democracy and one that just set up a Truth and Reconciliation and Reparation Commission (TRRC) that just began its work of looking into the abuse of human rights during the Jammeh regime. Mr. Barrow’s statement may be dismissed by his supporters as taken out of context, but the fact that those institutions of security apparatus which helped Jammeh abuse his power are largely still in control of these institutions sends a chilling message that their work may still be needed to instill fear in Gambians. Many would have given the president the benefit of the doubt if he has reference his power to the electorates who elected him into office. To completely ignore the fact that he was elected by the Gambian people and therefore true power belongs to Gambians and refer that power back to the security should be a cause for concern. President Barrow without a doubt is on a dangerous path with a direct collision course with Gambian political, human and civil rights activists. The Gambian people both at home and in the Diaspora have endured too much abuse and suffering for the last two decades to let any other leader abuse his powers to instill fear in Gambians. Mr. Barrow may have ambition to consolidate power and run for a second term contrary to the three year agreement he signed with the coalition, but his attempt to use the same fear mongering tactics used by the dictator will not sit well with Gambians and International rights groups. In fact uttering such statements while the International Community is rallying resources to help his government is very consequential. The Gambian people and International rights groups expect the Gambian leader to issue a statement immediately to clarify what exactly the president meant the powers of the security forces. Failure to clarify such statements will leave a lot of doubts in the minds of donors and International rights groups who have pledged to support the country’s National Development Plan and restoration of Democracy and Human Rights.